For companies and people alike, Aqaba International Industrial Estate offers sweet opportunity. Aqaba International Industrial Estate offers a sound and reliable base with proximity to important markets in the Middle East. Thanks to a free trade agreement established in 2001, bilateral trade and investment between the US and Jordan totaled $2.86 billion in 2015. Mohammad Gsouda, chairman and managing director of Qurina Food Co., located in Aqaba International Industrial Estate (AIIE) in Jordan, knows how to start a successful company. He’s done it more than once — and not by choice. “My partner Mr. Elfaitouri and I had started our first business in the food industry in Libya about 30 years ago,” he says. “Our products of canned food were distributed in the Libyan market and in neighboring countries.” Some products — like the company’s coveted date syrup — were exported to countries around the world. But delicious foodstuffs gave way to destruction. AIIE, managed by PBI Aqaba as a public-private entity, emerged from several potential locations across the Hashemite Kingdom of Jordan “because of its location in the Aqaba Special Economic Zone, and the nearby port which helps decrease our import and export costs,” Gsouda says of the growing Port of Aqaba less than 10 miles away. There are also direct surface transportation links to three neighboring countries. But it’s Aqaba’s “strategic location at the northeastern tip of the Red Sea between the continents of Asia and Africa that gives it great potential to be an important hub in international commerce,” Gsouda observes. Gsouda’s story is unique, but also typical, in a region that simultaneously is building its regional and international business profile while also doing all it can to welcome enormous numbers of refugees (many of them professionals) from countries in distress. As of late 2016, about 1 million refugees (many from Syria next door) had landed in a country of just 8 million people in total. The huge influx caused the Jordanian government in early 2016 to enter into the Jordan Compact, by which a $2.1-billion international aid package would be provided to the country through 2018 in exchange for Jordan’s pledge to create jobs for Syrians, who until then had been barred from legally working in Jordan. The country is setting up 18 zones across the country that can produce and send goods to EU markets free of customs, tax and quota requirements. The goal is to create up to 200,000 jobs by 2021. Those sectors and more are discovering the allure of Aqaba in general and AIIE in particular. The Aqaba Special Economic Zone offers a mere 5-percent income tax, and completely eliminates the income tax on exports, sales tax, import duties, social services tax and dividend tax for corporate facility project investors. Rasheed moved to Jordan from Iraq “for one year just for the opportunity,” he says. Now a decade has passed, and he has permanent residence. He says the country’s openness and good relations with other countries can be found in microcosm at the manufacturing plant, where qualified workers and engineering graduates from Jordan, India, Egypt and other nations work shoulder to shoulder. In a report last year, Oxford Business Group laid out the business case for Aqaba and for AIIE: “Logistics and tourism have traditionally taken priority in the city, but this is now changing, as the city — and the wider region — raises its industrial profile,” said the report. AIIE, said the experts, is poised to be a prime actor in the region’s near- and long-term future, as the number of people working for companies on the estate is expected to double from the current 2,500 when AIIE reaches full capacity in the next five years. The separate Shenzhen Aqaba Estate — brought about via an agreement among PBI Aqaba, China’s Shenzhen Chamber of Investment and the Aqaba Development Corporation — will essentially be an expansion of AIIE, adding 1 million sq. m. (10.7 million sq. ft.). In September, AIIE and the Aqaba SEZ were paid a visit by His Majesty King Abdullah II, who said the zone would play a central role in boosting the investment climate of the country, in accordance with the Jordan Economic Growth Plan 2018-2022. Even as he emphasized infrastructure project opportunities, he stressed how much potential there was for Aqaba to become a major international tourist destination, as more flights are secured from around the world to King Abdullah II International Airport. That airport is located a mere 700 meters from AIIE. The proximity only reinforces the layered opportunities to be found in the region — combining industry and global logistics with the world-class heritage, tourism and quality-of-life assets in Aqaba at large. His Majesty also was briefed by AIIE CEO Sheldon Fink and toured a number of factories on the 1.7-million-sq.-m. (18.3-million-sq.-ft.) industrial estate. Owners and factory managers told the king they chose Aqaba due to the Kingdom’s stability and its free trade agreements with several countries around the world. To that they might also have added the reliability and convenience of AIIE’s properties and services. Aqaba also aims to be a major international tourist destination and a model in sustainable development. Qurina’s Mohammad Gsouda has seen that progress with his own eyes. This Investment Profile was written under the auspices of PBI Aqaba Industrial Estate LLP. For more information, visit www.pbiaqaba-jo.com or call +962 3 205 8000. 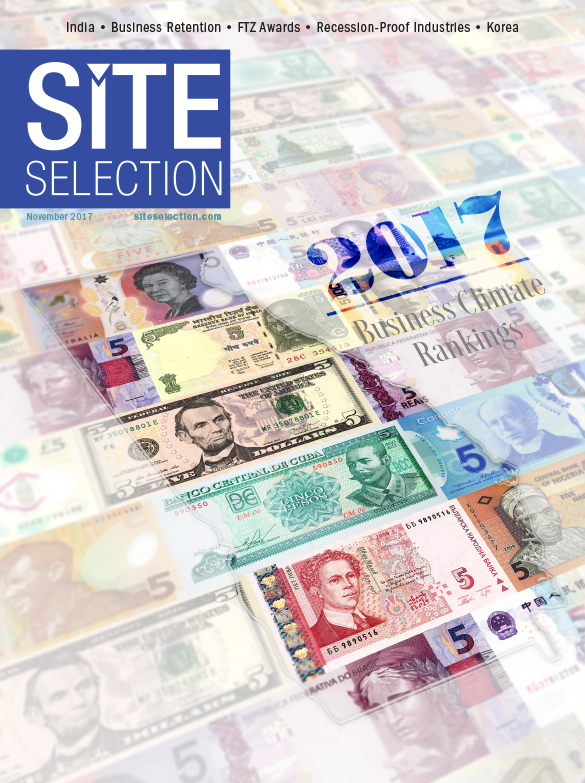 Adam Bruns has served as managing editor of Site Selection magazine since February 2002. In the course of reporting hundreds of stories for Site Selection, Adam has visited companies and communities around the globe. A St. Louis native who grew up in the Kansas City suburbs, Adam is a 1986 alumnus of Knox College, and resided in Chicago; Midcoast Maine; Savannah, Georgia; and Lexington, Kentucky, before settling in the Greater Atlanta community of Peachtree Corners, where he lives with his wife and daughter.